When I was a young kid in Hong Kong, I tried this dish at a restaurant for dinner. I just fell in love with the first bite of the pineapple and pickled ginger. If you like the classic sweet and sour pork dish, you don’t want to miss to try this one. 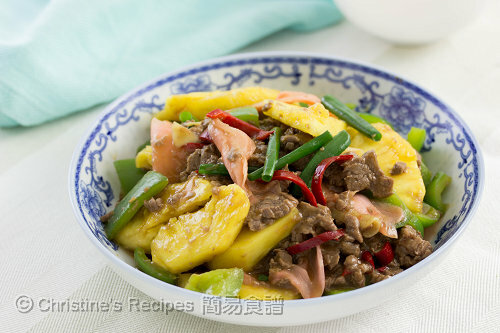 The savoury juicy beef is so tender, got balanced its taste so well with the two sweet and sour ingredients. A side note, in Hong Kong, we used to make this dish with the pickled ginger bought from markets. It tastes sweet and sour with pale yellow in colour. Here in Australia, I can’t easily get those pickled ginger. So I tried the sushi ginger and found it wonderfully worked for this recipe. Soak the pineapple slices in salted water for about 15 minutes. Drain well. Slice the beef into thin slices across the grain. Mix with marinade. Set aside for 15 minutes. Heat oil in a wok over high heat. Add beef and spread it to one layer. Pan fry both sides until the colour changes, about 80% done. Set aside. Add some oil in the same wok. Decrease heat to medium. Saute garlic and red chilli. Add capsicum. Season with salt. Stir to combine. Stir in the pineapple slices. Toss back the beef in wok. Pour in the sauce and cook to your preferred consistency. Add the pickled ginger. Serve immediately. If you can’t get fresh pineapple, you might use the canned one, with natural juice inside. 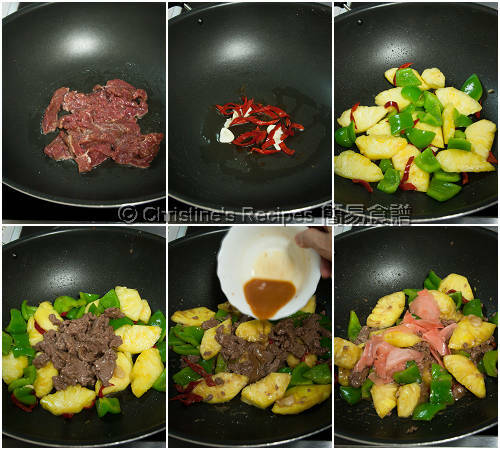 The best cut for making stir fry dishes is beef fillet. Beef skirt / shirt steak comparatively inexpensive, is also a good choice. This is really appetizing and moreish! I tried this recipe tonight. Serve it with brown rice and the dish looked exactly the same as your pictures. WOW! What an abundance of flavours! 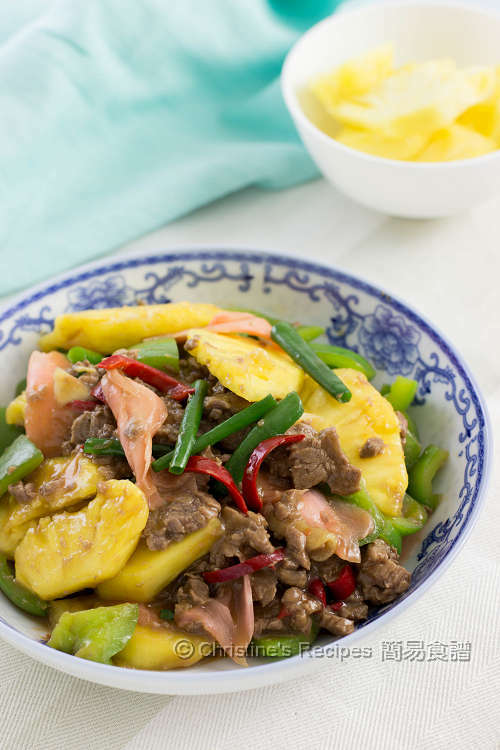 I will put this recipe in the same category as the mango and chicken with walnuts recipe. It's always interesting cooking meats with fruits together. Thanks Christine for another amazing recipe! Wow, thanks for your feedback. Really glad that you loved it. I can't find pickle ginger, do you have the recipe for making pickle ginger? 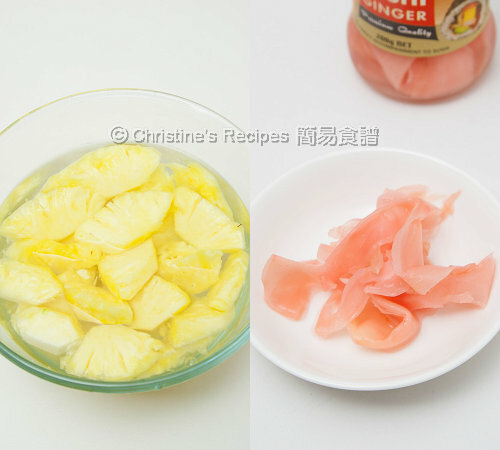 Don't have the recipe of making pickled ginger on this blog up to now, sorry. You might skip it if you don't have any. Made this dish a few weeks ago! My sister and I wanted to make some chinese dishes to serve to some Korean friends. This was perfect! We actually purposely brought pickled ginger for this dish. Will be making this again! Thank you so much for your recipes, reminds me of food from home especially when you are away in college! My sister and I posted it on our blog because it was really good: https://sprinkleofvanillasugar.wordpress.com/2016/02/29/2573/. We made it oil free for a healthier twist but just as good! What a beautiful writeup you've got on your post. Love it! Thanks for trying this recipe and your link love.